JBL EON 610 - 10" Two-WayMore than just another great JBL sound system, the new EON600 is a true step forward in technology developed specifically to deliver the best sound possible regardless of its application. Completely rethinking how truly good an affordable self-contained, portable PA system c.. STUDIO 50 USB Studio MonitoringHigh-Resolution, 150-Watt Bi-Amped Reference Studio Monitors with USB InputUltra-linear 2-way digital monitor speakers ideally suited for computer studios, audio and multimedia workstationsTrue bi-amping mode with 4 amplifiers for ultimate high-resolution sound150 Watt..
MS16 High-Performance, Active 16-Watt Personal Monitor SystemCompact stereo speaker system ideally suited for home studios, multimedia applications, keyboard and vocal monitoring, etc.Powerful 4" woofers and high-resolution tweeters powered by two 8-Watt amplifiersDedicated Volume, Bass and Treble c..
Speaker Aktif Turbosound iQ-82 way full range loudspeaker for portable PA and installation applications2,500 Watt power featuring KLARK TEKNIK Class-D technologyKLARK TEKNIK Digital Signal Processing for total system controlSpeaker modelling includes accurate models of industry standard speaker..
JBL LSR 305 Two-Way Powered Studio MonitorBi-amplified Studio Monitor with Magnetically-Shielded 5” Low Frequency Transducer and 1” Soft-Dome High Frequency Transducer and Image Control Wave Guide. Class-D 41 Watt RMS Amplifier for LF, and 41 Watt RMS Amplifier for HF. Balanced XLR and ¼” TRS Inputs..
Bose L1 Compact systemBose® Spatial Dispersion™ loudspeaker technology delivers sound evenly across the stage and throughout the audience—even to the extreme sidesTwo ToneMatch® channels with fixed presets for a handheld microphone and an acoustic guitarIntegrated bass speaker in power standTwo setu..
Yamaha DZR315 Dante 2000W 3-way Powered SpeakerThe Yamaha DZR315-D offers superb clarity and best-in-class SPL performance. This 3-way bi-amped PA speaker boasts a high-power 2,000-watt Class D amplifier and a 31Hz–20kHz frequency range, and it can tackle any application you throw at it. Sophisticat..
Mackie Thump 15 Boosted 1300 WattThe Thump15BST delivers chest-thumping low end, thanks to Mackie's proprietary Dynamic Bass Response, along with wireless control and Bluetooth streaming. The built-in three-channel digital mixer features a pair of Vita+ preamps with Wide-Z technology, effortlessly h..
Mackie Thump 12 BOOSTED 13000 WattThe Thump12BST delivers detailed midrange and abundant bass, thanks to Mackie's proprietary Dynamic Bass Response, along with wireless control and Bluetooth streaming. A built-in three-channel digital mixer features a pair of Vita+ preamps with Wide-Z technology, ef..
dbTech Opera 12 12" 1200 WattWith the new OPERA series, dBTechnologies succeded once again in packing leading edge DSP processing, advanced design features and user friendliness in an unrivalled cabinet in its price range.Exceptional power and a unique acoustic design combine in order to deliver a v..
dbTech Opera 10 10" 600 WattWith the new OPERA series, dBTechnologies succeded once again in packing leading edge DSP processing, advanced design features and user friendliness in an unrivalled cabinet in its price range.Exceptional power and a unique acoustic design combine in order to deliver a vi..
JBL C50 PACK Packaged Surface-Mount Subwoofer-Satellite Loudspeaker SystemThe Control 50 Series subwoofer-satellite loudspeaker system provides high ﬁdelity sound in restaurants, retail stores, music cafes, health clubs, theme bars, leisure venues, or any location where full-range high ﬁdelity foreg..
Samson Auro X12D - 1000W 2-Way Active LoudspeakerSpeaker Aktif Samson Auro X12D ini berdaya 1000 watt sehingga memiliki suara yang sangat jernih dan berkualitas, dan sangat cocok di gunakan di tempat luas,live event, serta event lainnya..
Yamaha BR15 15" 2-Way SpeakerWhile maintaining the great sound of the Concert Club series, the BR series provides cost-effective speakers in three configurations to match a wide range of applications. Inheriting the excellent portability and placement flexibility that characterized previous models i..
Yamaha BR12 12" 2-Way Speaker CabinetThe BR series speakers were developed and are produced in the USA to carry on the proven audio quality and reliability of Yamaha's acclaimed Concert Club series. Using parts and components carefully selected for audio quality and reliability, Yamaha has optimized..
Yamaha HS8 Powered Studio Monitor2-way bass-reflex bi-amplified nearfield studio monitor with 8" cone woofer and 1" dome tweeter38Hz - 30kHz frequency response75W LF plus 45W HF bi-amp system for high-performance 120W power amplificationROOM CONTROL and HIGH TRIM response controlsXLR and TRS phone j..
Yamaha HS7 Powered Studio Monitor2-way bass-reflex bi-amplified nearfield studio monitor with 6.5" cone woofer and 1" dome tweeter43Hz - 30kHz frequency response60W LF plus 35W HF bi-amp system for high-performance 95W power amplificationROOM CONTROL and HIGH TRIM response controlsXLR and TRS phone ..
Yamaha HS5 Powered Studio MonitorFeatures2-way bass-reflex bi-amplified nearfield studio monitor with 5" cone woofer and 1" dome tweeter54Hz - 30kHz frequency response45W LF plus 25W HF bi-amp system for high-performance 70W power amplificationROOM CONTROL and HIGH TRIM response controlsXLR and TRS ..
Mackie MR6mk3 6.5" Studio MonitorMusic-centric voicing perfect for modern mixing, monitoring and multimedia applications Enhanced waveguide system delivers unmatched clarity and openness Minimized reflections and diffractions for wider sweet spot Seamless transition from high to low fr..
Yamaha DSR215 Dual 15" 2-way Active LoudspeakerProses suara digital dengan perbaikan 48-bitProses dinamis multi-band D-CONTOUR (Dynamic-CONTOUR)aplifier kelas D terbaru 1300W dengan perubahan modus supply daya PFCPuncak maksimal SPL 138dBProteksi kelanjutan dari transducer, amplifier dan supply daya..
JBL PRX 412M Two-Way Stage Monitor and Loudspeaker SystemPRX412M is a portable, twelve-inch, two-way speaker system designed for either main sound reinforcement or monitoring applications.Features90° x 50° coverage for even and smooth response on and off axisDual-angle pole socket for applications r..
JBL PRX425 15" Two-Way Loudspeaker SystemPRX425 dual fifteen-inch, two-way is the perfect choice for DJ’s and bands who need low-frequency extension from the convenience of a stand-alone cabinet.FeaturesDual 15" two-way design90° x 50° coverageHeavy Duty 16 gauge protective screen backed steel grill..
Samson Auro D415 Active 15 Inch 400 Watt Designed to encompass the key elements of power, portability and exceptional sound, Auro D415 is a lightweight, 2-way active loudspeaker enclosure that combines superior components and meticulous engineering. Delivering 400 watts of output power, Auro D415 ..
Samson Auro D412 Active 12 Inch 400 WattDesigned to encompass the key elements of power, portability and exceptional sound, Auro D412 is a lightweight, 2-way active loudspeaker enclosure that combines superior components and meticulous engineering.Delivering 400 watts of power, Auro D412 features a ..
Russel RS-115A Active 15 inch 250 Watt2 Way full range Woofer 15 inchmagnet 60oz Voice Coil 3" KSV Tweeter 44mTi.Diap.Driver RMS power 250 WattImpedance 8 Ohm, Voltage AC 220V 50HzFrequency range 40Hz-18KhzSensitivity 98dB (+/-2dB)Connector XLR/6.35/RCA..
Russel BR-215A Active 2x15 inch 400 WattSpeaker 2x15 inchSystem Passive 2 way full range, magnet 60ozVoice coil 3" KSV, Driver 44mmRMS power 400 Watt, Impedance 4 OhmFrequency range 45Hz-18kHz, Sensitivity 98dB (+/-2dB)Connector XLR/6.35mm/RCA, Mic Output Level <5mvLine input/Output Level 250 mv,..
Russel BR-212A Active 2x12 inch 300 WattSpeaker 2x12 inchSystem Active 2 way full range, magnet 60ozVoice coil 3" KSV, Driver 44mmRMS power 300 Watt, Impedance 4 OhmFrequency range 45Hz-18kHz, Sensitivity 98dB (+/-2dB)Connector XLR/6.35mm/RCA, Mic Output Level <5mvLine input/Output Level 250 mv, ..
JBL SRX715 15" High-Power Two-Way LoudspeakerThe SRX715 offers the highest level of performance available from a portable, pole or tripod mountable speaker. FeaturesLight-weight and very high-power.75°x 50°coverage.Bi-amplified or full-range passive operation.Dual-angle pole socket for applications ..
JBL PRX-612M 12 in. Two-Way Multipurpose Self-Powered SoundPRX612M is the most compact and versatile speaker in the PRX600 Series. It has been designed to deliver maximum performance for its weight and size as both a stage monitor and a front of house main PA. FeturesMaximum SPL 134db peakDual purpo..
JBL EON515 Active 15 inch 625 WattWIth the EON 515XT, JBL has extended the reach of the current EON technology by improving input sensitivity, lowering the noise floor, adding user selectable EQ control and re-voicing the system for peak performance and enhanced audio precision. The intuitive onboar..
PROEL EX-12A Active 12 Inch 130 WattEX12A 12" 130W 2-Way Active Loudspeaker from Proel delivers powerful audio from a compact and lightweight package, ideal for PA and live monitoring applications in a variety of venues. The 18mm MDF cabinet provides excellent durability and rigidity. The cabinet ho..
Nakamichi Synthesis F1 High Performance 3 way Music Monitor SpeakerThe Nakamichi Synthesis F 1 High Performance 3-way Music Monitor Speaker provides exceptional musical and vocal performance used in wide variety of applications.FurturesDurableCurved front baflle minimalizes diffractionPerforated met..
Russel RS15A Active 15 Inch 600 Watt (per pasang)Russel RS 15A is a premium Active 15 inch loudspeaker with huge power and able to match it's competitor in the same line : The Huper AK15A / HA15400 or Beta3 U15A.AC 160 V - 220 V Switching Power Supply600 Watt Active SpeakerHigh-Low EQ with Master Vo..
Powerart PA-15A Active 15 inch 250 WattThe latest 2014 model of pro audio speakers from Powerart, the New PA-15A is a market leader for active speakers for either indoor or outdoor use and it comes with a very reasonable price! With excellent build quality, you will never find another bargain as goo..
Mackie HD12211200-watt High-definition 2-way Loudspeaker, Active, with 12" Woofer, 3" Voice Coil, 1.75" Compression Driver, Patented Acoustic-correction, and Birch Cabinet (each)Go "High-def" for Amazingly Articulate Sound!For incredible power and clarity, trust Mackie's HD1221 2-way high-definition..
JBL EON615 1000-Watts15" Two-Way Multipurpose Self-Powered Sound Reinforcement More than just another great JBL sound system, the new EON600 is a true step forward in technology developed specifically to deliver the best sound possible regardless of its application. Completely rethinking how truly g..
Wharfedale Titan 15D - Active LoudspeakersThe Titan 15D active PA speaker is the result of years honing the Titan design. 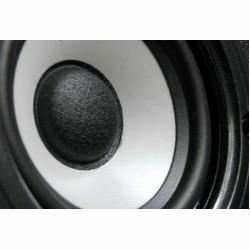 Q-Bit DSP technology, a titanium compression driver and a heavy-duty cast-frame woofer, ensure absolute accuracy, high output and the smooth, wide dispersion of the cri..